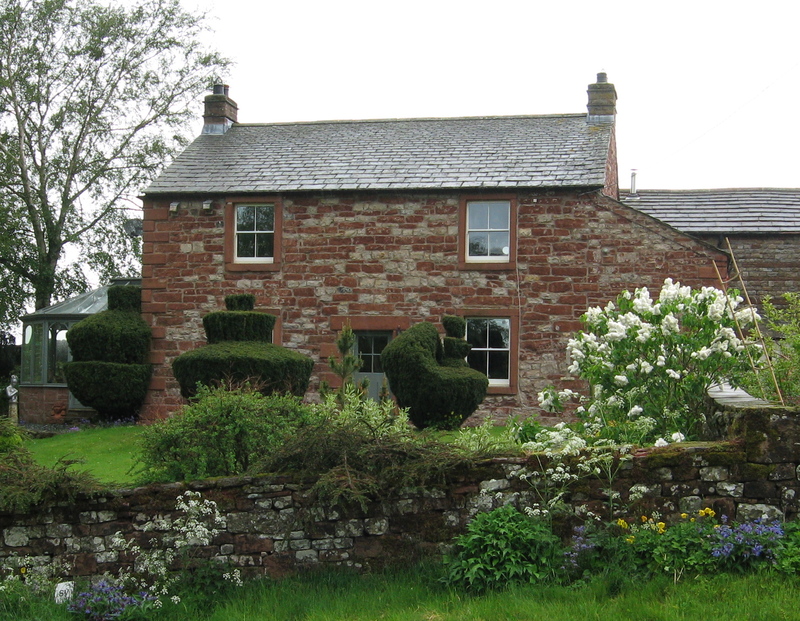 This post is about Elizabeth Westgarth and the family to which she belonged in Gamblesby in Cumberland (now Cumbria) in north-west England. Elizabeth was my grandfather William Smith’s paternal grandmother. So she was my great-great-grandmother. Elizabeth Westgarth was born in Gamblesby on April 6, 1797; she was the oldest of three daughters born to John Westgarth and Ann Falder. Elizabeth’s younger sisters were Mary (born 1802) and Ann (born 1804). Ann Westgarth died when she was 4 years old so Elizabeth had only one surviving sister. She had no brothers. Elizabeth married Lancelot Smith in 1817 and lived much of her life in Gamblesby. They had ten children while living there. This is a recent photograph of the house where they lived. Elizabeth Westgarth died in Ireland on August 22, 1859, and was buried in the churchyard of the Anglican Church of St. John the Baptist in Cashel, County Tipperary. 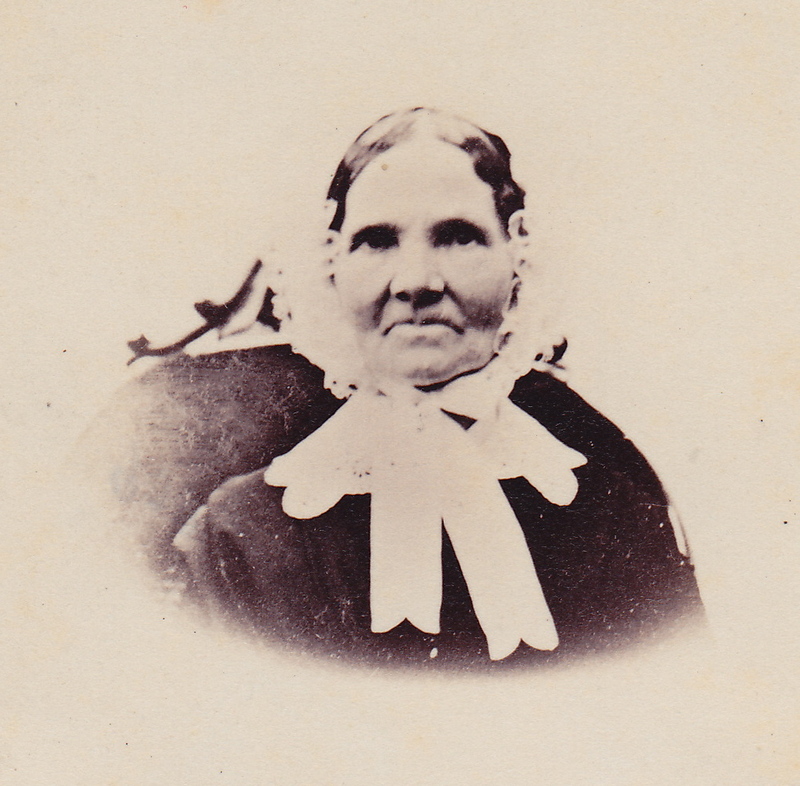 This is the only photograph I have of Elizabeth Westgarth; the picture was probably taken in the early- to mid-1850s – maybe around the time when she moved to Ireland with her family. Elizabeth’s father John Westgarth was a cordwainer, which is to say a shoemaker (this occupation was different than a cobbler who simply mended old shoes). Elizabeth’s mother Ann Falder was from Unthank, which is a very small community close to Gamblesby. In historical records from the nineteenth century, it is described as a hamlet within Gamblesby township. Ann’s father John Falder was a farmer. John Westgarth was about 37 when he married Ann Falder in December 1795 in the Addingham Parish Church in Glassonby. He died in 1821 in Gamblesby, aged about 63. John’s wife Ann died in Gamblesby in 1833. Both were buried at Addingham Parish Church. In 1829, Elizabeth’s sister Mary married Thomas Salkeld a yeoman farmer in Gamblesby. Thomas was considerably older than Mary and he died in 1846, leaving her with two young sons Joseph and Benjamin. Joseph was apparently not interested in farming and eventually he became a designer of machinery for woollen mills in Yorkshire. So Benjamin inherited the farming property from his father. In 1851, he was living with his cousin Lancelot Smith in Gamblesby and with Lancelot’s sister Hannah and brother William. In the 1851 census, Benjamin was described as a “landed proprietor under trustees”. He was 17 at the time. Benjamin continued to live in Gamblesby until he died in 1888 at the age of 55. In his will, he made bequests to the oldest son and youngest daughter of his cousin Lancelot Smith of Corballis. To Lancelot Smith of Beaverstown, he bequeathed his gold watch. And to Sarah Ann (Sally) Smith, he bequeathed the sum of £50; that would be worth about £21,100 in income today. It seems that Benjamin kept in touch with his Smith cousins after they went to Ireland. Benjamin’s older brother Joseph was the heir to the Salkeld land in 1888 but I do not know what happened to his inheritance. Strangely enough, Joseph died in Donabate, County Dublin, in 1898. I assume he was visiting his cousins the Smiths in Corballis at the time. Joseph was 67 when he died. I wonder if he was buried in Donabate. Neither Joseph nor Benjamin Salkeld was ever married. To complicate matters, Joseph Salkeld made no will and his estate became the subject of legal action in a case called Varty v. Cowen. I am hoping some time to discover the details of this case. I think the Varty in the case could have been Henry Varty (who was related to the Westgarths) and the Cowen could have been Sarah Cowen, Lancelot Smith’s sister who returned to live in Gamblesby after living in Ireland for almost 20 years. Although Elizabeth Westgarth had only two nephews from her sister’s marriage to a Salkeld, she had numerous relatives through her father John Westgarth. Thanks to her grandfather’s large family (assuming all the children survived to adulthood), Elizabeth Westgarth had six uncles and five aunts. By my count from parish records, Elizabeth had 19 Westgarth cousins plus an unknown number of cousins who were children of her Westgarth aunts. There were so many Westgarths in the community of Gamblesby in the late eighteenth century and the first half of the nineteenth century that I had some difficulty in sorting out which family was which when looking at church records, censuses and local directories. For example, when Elizabeth was born in April 1797 there were two girl cousins also born around the same time. All three Westgarth girls were baptised on the same day in April 1797 at the Addingham Parish Church at Glassonby. Another complication was the fact that the same forenames were used time and again – and no one had a second forename. So there were lots of Westgarth girls called Elizabeth, Sarah, Mary and Ann. The Westgarth boys were usually called Thomas, John, Anthony, and William. The cordwainer John Westgarth had two full brothers, Thomas, the oldest son, and Anthony, the third son. Between them they had nine children, eight of them girls. The sole boy, Thomas died at the age of six. John’s four half-brothers had 13 children, eight of them boys. As far as I can tell, several of John’s brothers and nephews continued to farm in Gamblesby or nearby communities. In 1829, there were three Westgarths who were yeomen in Gamblesby: Thomas, William and George. I believe Thomas Westgarth was John’s older brother and the other two yeomen were his younger half-brothers. In an 1847 county directory, there was only one yeoman listed in Gamblesby for the Westgarths: Thomas Westgarth. Most likely, he was the son of William Westgarth and, therefore, one of Elizabeth’s cousins. John’s youngest half-brother Isaac Westgarth was a cordwainer and shopkeeper by that time. Other Westgarths could have been farming in the Gamblesby area but it is difficult to be sure about that. Tracing the Westgarths further back using church records, John Westgarth senior was born in 1724 and died in 1794 in Gamblesby. John senior’s father was Thomas Westgarth and he also was from Gamblesby. Thomas was born around 1686 but I do not know when he died. Thomas’s father may have been another John Westgarth. It seems the Westgarths were living in Gamblesby as far back as one can trace in church records. Looking at the family of Elizabeth Westgarth’s mother, the Falders, they too were living in the Gamblesby area – specifically in Unthank – for a long time. Elizabeth’s mother Ann Falder was born in Unthank in 1760 and she was the youngest child of John Falder and Elizabeth Watson. John Falder was born in 1719 in Unthank. John and Elizabeth were married in the Addingham Parish Church in Glassonby in 1746 and they had five children. John Falder’s father was also called John Falder, from Unthank. 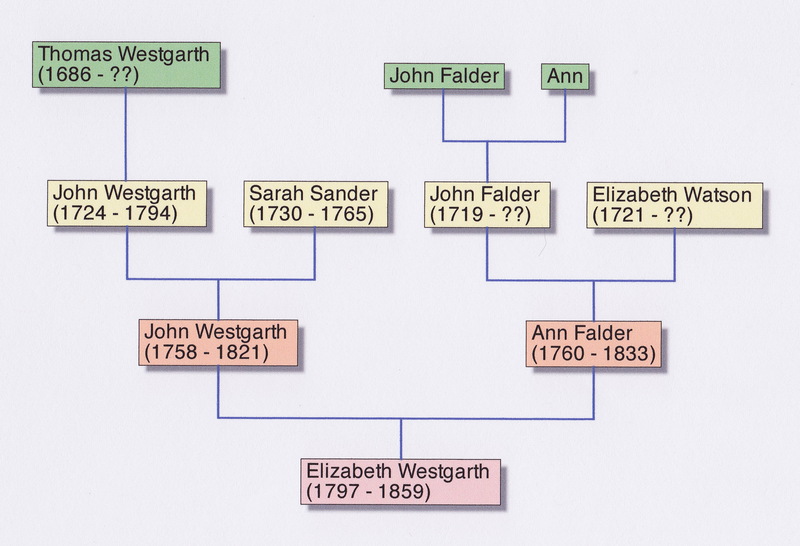 Following is a pedigree chart for Elizabeth Westgarth that shows what I have learned so far about her ancestors in Gamblesby and Unthank, Cumberland. This entry was posted in Falder, Families, Gamblesby, Photographs, Salkeld, Smith, Tipperary, Westgarth and tagged Falder, Gamblesby, Mrs Smith, Sander, Smith, Tipperary, Westgarth. Bookmark the permalink. Once again – enjoyed the latest update. Thanks very much for your comment. The Mounseys of Clashnevin are next. So interesting a lot of info there. Thanks so much!